one only object in one hand. The PLH Aria control systems is designed and built to make the controls and the ergonomic operation of the devices intuitive. Four available functions, programmable by the free app, and various combinations and functions that can be linked according to the device: Neo Q, Lighter, Neo Aria or Air Makeup. Click, rotate clockwise or counterclockwise or shake: decide what and how to control it! PLH Aria devices are Patent Pending. 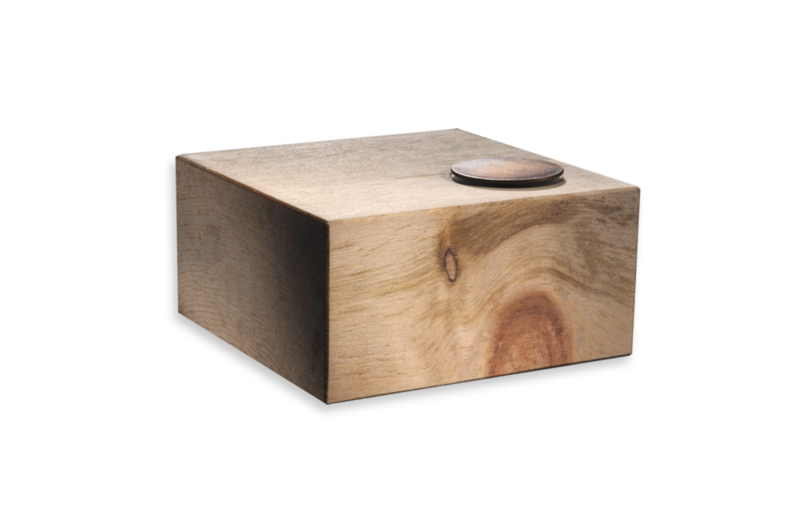 Table-top, with a registered design, entirely in solid wood or marble size 9 x 9 x 4.5 cm. Operation through a single circular button made of metal (aluminum or brass depending on the model chosen) with a diameter of 29 mm and a thickness of 5 mm provided with 4 functions: click, clockwise, counterclockwise, shake. Powered by an interchangeable battery (approximately 20,000 operations) and wireless technology, it is programmed with the specific free app through Apple iPhone or Apple iPad and controlled by iOs, watchOs or Android systems. Contact our Partners for purchase. Portable device with registered design, fully cylindrical cast aluminum anodized cylinder 4,5 cm in diameter and 29 mm in diameter. Operations through a single circular button made of metal (aluminum or brass depending on the model chosen) with a diameter of 29 mm and a thickness of 5 mm provided with 4 functions: click, clockwise, counterclockwise, shake. Ton sur ton or bicolor versions are available. Wall mount device*, 29 mm in diameter. Operations through a single circular button made of metal (aluminum or brass depending on the model chosen) with a diameter of 29 mm and a thickness of 10 mm provided with 4 functions: click, turn clockwise, counterclockwise. All the finishes and treatments from the PLH Neo collection are available. (*) to use with built-in adaptor N.Box for lightweight walls, or masonry. Portable device, square in solid aluminum, brass or wood dimensions 81 x 81 x 10 mm. Operations through four round metal buttons (aluminum or brass depending on the model chosen). All the finishes and treatments available in the PLH Makeup collection are available.